The Historic Centres of Berat and Gjirokastra are both well-preserved Ottoman towns, decorated with outstanding examples of kule: Balkan-Ottoman style tower houses. Both towns have been inhabited continuously since ancient times. Berat has been particularly marked by the peaceful coexistence of Ottoman Islam with a large Christian minority. The designated area includes Berat castle, mosques, churches and the Gorica bridge. Gjirokastra was built around a 13th century citadel. From the 14th to the 19th century it developed into a regional center. Residential quarters, the bazaar, churches and mosques were built vertically and in stone. Berat and Gjirokastra are two towns in Central Albania, located some 150 kms apart. Their strength lies in vernacular urban housing and monuments from the Classical Ottoman period. Both are also towns that developed in and around a citadel. Gjirokastra is locally called Gjirokaster, the -kastra comes from the Northern Albanian dialect. It first became a WHS on its own in 2005, while Berat was added as an extension 3 years later. I started my visit to this WHS in Gjirokaster, en route from Butrint to Tirana. I arrived by bus in the Lower Town, and decided to walk up to the historical area. It does look like a steep climb, but it takes only 20 minutes and it awards one with great views of the rows of tower houses Gjirokaster is known for. The historic center has a real authentic feel and I had a great time staying there overnight. This was further enhanced by local son Ismail Kadare's Chronicle in Stone, which I was reading. He describes life as a child in Gjirokaster during World War II. At that time it was a city with so many mosques "you could walk down the street, stretch your arm, and hang your hat on a minaret". 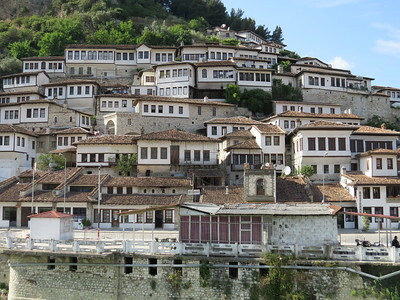 A few among Gjirokaster’s 200 tower houses are open to visitors. The Etnographic Museum has interesting displays on how people lived, though the building itself is a modern reconstruction (on the site of the birth house of the other famous native, Enver Hoxha). Across the street lies the Skenduli house, which was returned to the Skenduli family after the fall of communism. They take visitors on a guided tour around their house, which is huge. The talks were informative, but the visit a bit rushed. The best of the tower houses is Zekate house. This lies at the top end of the village, a house that had attracted my view already from various viewpoints around town. Here one can wander alone from room to room, and for example admire the painted fireplace. In the late afternoon I climbed once more, this time to the Castle of Gjirokaster. It houses a military museum (which is not exactly to my taste), but it holds some other points of interest such as a tekke from the Bektashism sect and the remains of an US airplane captured during the Cold War. The on site museum tells Gjirokaster’s history well, and is very critical about Hoxha who they claim only visited his home town a couple of times after he came to power, and only did so during staged mass rallies. After Gjirokaster I travelled on by bus to Berat. Including a change in Fier this takes about 3 hours. Berat is a totally different city, much more ‘tainted’ by communist era structures. The views on the old Ottoman quarters Mangalem and Gorica from both sides of the Osum river are worth it though. What it does have preserved better than Gjirokaster are its religious buildings. I especially enjoyed the small area with the King's Mosque, the Helveti Tekke and the Han (Inn) of the Derwishes. A definite letdown for me was the Berat Citadel. It’s not in a good state (think: rubble, lots of trash, overgrown areas), and the structures need great imagination to fit to names such as 'Red Mosque'. Not to be missed inside the citadel however is the Onufri Museum – a museum holding icons made by the artist Onufri. It is located in the Saint Mary Church, which has its original wood-carved iconostasis from 1806. Visiting Berat and Gjirokaster takes the best part of two days, and to me these were the most rewarding and most 'Albanian' sights of my week long stay in the country. 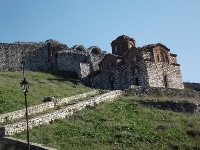 Berat: The fortress area is spacious, but very good to roam on foot. The view from above is very nice, there were only a few other visitors there, so you could really look at everything in peace. The small museum is also worth seeing, but it costs extra. There are offered for sale very beautiful even embroidered tablecloths. Gjirokastra: I highly recommend a visit. In my opinion it is the most beautiful city in Albania. Marvel at the old streets, houses covered with stone. This medieval atmosphere... You can visit the castle, which houses a military museum and a few old houses. You can stay overnight in one of the inns, to feel the atmosphere of Albania. I recently travelled through Albania by bus from Ulcinj (Montenegro) to Sarande stopping in Skodra, Tirane, Berat and Gjirokastra along the way. The road to Berat from Lushinje was the bumpiest of the journey, about 30 kms. The old town of Berat had much to offer in the way of churches, mosques and a monastery, as well as the castled perched above a cliff overlooking the whole region. Similarly the view from the citadel of Gjirokastra extended over the whole Drina valley. The museum in the citadel contains quite an arsenal of old weapons, together with a captured US spy plane from the Cold War era. I was in Gjirokastra just one day before it was proclaimed a world heritage site.My first impressions on the city were very complex, but one thought stayed in my mind during the whole trip, what was it like to live there 200 years ago, who were the people that lived in those magical and mystical houses, and what did the great castle witness during centuries of war. The city spoke of greatness and the stone houses together with the amazing view of the mountains and valleys, reflected the character of the people there. Amazing,rigid, mystical,friendly, this was Gjirokastra in one day for me. Berat and Gjirokaster are well-served by public buses, whether you're coming from the North (Tirana) or South (Sarande/Butrint). Both are fairly sizeable cities on an Albanian scale. There are two direct buses a day between the two, or you can change for a more frequent connection via Fier. Ottoman Empire: Well-preserved Ottoman town.